Reedus sat quietly in his room, shrouded in the think darkness that had blanketed his entire village. Fumbling through his things, the blue Peophin reached for a small leather pouch. A dim light peeked through the opening just as he reached inside. He withdrew what appeared to be a tiny fragment of fire, or what he called a fire mote. This peculiar little substance was now the only source of light throughout the whole village. Reedus had hoped that it might be a start to helping fix the village's problem of losing access to the sun, or at the very least, give him enough light to search for other substances to experiment with. But unfortunately, the mote was barely strong enough to brighten the rest of his bag containing all his other mote creations. Having always had a mind for alchemy, the young Peophin had been making motes ever since he could remember. He would try out various substances he hoped could be used to create something others would find useful. However, the opportunities to market his creations were limited. His village only housed two dozen other residents, and visitors were as rare as a Shadow Usul sighting. Up until two weeks ago, the village had been running smoothly as usual. Bordering Meridell and Meri Acres Farms, the small pocket of land was an often overlooked farming community. With such a tiny population, however, everyone had their own jobs and the village managed to sustain itself well. But all of a sudden everything went black. For some reason, the Darigan Citadel had decided to move and situate itself right over the village, blocking the natural sunlight and trapping the region in near perpetual darkness. During the peak daylight hours there may have been just enough light spilling out from the corona of the Citadel for everyone to manage to see, but outside of those two to three hours it was like night without any stars. This caused an immediate disruption and within days, residents were beginning to sleep longer and performed less work. As the situation continued and the struggle was starting to hit, many residents were thinking of relocating. Reedus' mother Penny had planned on leaving their home soon. "Meridell isn't that far," the purple Peophin assured her son. "They are also prepared to prevent things like this from happening so we won't have to worry anymore." Reedus however, was infuriated that his mother would simply allow a castle to just plop over their home and stomp on them as if they were a doormat. He just hoped for a solution—any solution—so that they could take back their village. Then one day, just as the light hours were dissipating, Reedus and the rest of the village had spotted a mysterious glowing object in the distance. "What is that in the sky?" Reedus asked. "It's so bright!" "Is it a star?" his mother inquired. Mr. H, regarded throughout the village for his wisdom and guidance, carefully observed with the other villagers that had congregated along Main Street. "It can't be," he replied. "It's too low." The green Skeith continued to watch as the object grew bigger and bigger. "It's coming right at us!" he yelled. As it came closer, the surrounding fields and streets became illuminated in a radiant shade of bright green light. Reedus' eyes widened in amazement as he and the other villagers took in a collective sigh of relief. "We have light again!" Mr. H rejoiced. "It's like I can see for the first time!" a brown Ixi exclaimed. Everyone was already celebrating amongst themselves when the object finally approached. As it flew down toward the crowd, it revealed itself to be a stunning glowing Buzz. Shining brighter than a star with swift wings that fluttered with grace, the villagers admired his elegance. Before he even had a chance to open his mouth, the townspeople erupted in enormous applause. "Thank you, whoever you are!" William, the brown Ixi called. "You've saved our village!" Penny cried out in joy. "You're our hero." Before they knew it, the Buzz flew back up to the sky and hovered over the now lightened village. In the presence of the Buzz, who everyone simply referred to as, "the Light," the village quickly began to come back again. Reedus was able to make more of his magical motes, farmers were able to tend to their gardens, and everyone was working more efficiently again. The residents were not only happier but also excited to have someone to help boost their village. Within days, the Buzz had already apparently demonstrated his value to the community by saving a young baby. After a Draik named Amelia had gone astray during a trip in the berry fields with her father, the Light had located and rescued her within the hour. Amelia's father Carlton was so grateful to be reunited with his baby, the blue Draik constructed a beautiful glass statue in the Buzz's likeness comprised of shards of stained glass that glimmered in the glowing aura. The village even decided to place it right in the center of their neighborhood in honor of the Light's heroic efforts in saving the village. Like the rest of the village, Reedus couldn't have been more grateful and found the Light to be nothing short of a miracle. He had quickly become all anyone could talk about. "What would we have done without the Light here to bring us out of the darkness?" an enamored Mr. H wondered. "Where could such a being have came from?" he added. "I don't know but it must be someplace special. I hear he even has super strength!" William responded. "He must also have super hearing," said Reedus. "How else could he have heard Amelia crying from so far away and find her so easily?" "My neighbor told me someone even saw laser beams shoot from his eyes! It's like he's a superhero!" William added in excitement. "He can probably do anything." Reedus didn't know if all the things he heard about this new found hero were true or not, but regardless, he was thrilled to have someone that everyone could look up to and that could watch over the village. The Peophin gazed around him and saw a certain confidence among the residents he had never seen before. This was no longer the same quiet little village no one knew existed. Everyone was more productive than ever, actively growing and working hard on improving their way of life. Due to the upswing of activity in your area, there has been an increase in noise output that has had a negative impact on daily life within the Darigan Citadel. In response, I hereby demand that all residents vacate this area. Anyone remaining by the end of the month will be removed by force. Murmurs of anger flooded throughout the village in response to the letter. "They can't keep doing things like this," Mr. H proclaimed. "Well, they won't get away with it this time. Now we have the Light to save us," Penny replied. With Reedus and the rest of the village gathered around the statue of the Light, the group patiently waited until the glowing Buzz swooped down to hear their pleas. Various voices called out to him from the group.. "Help us! Save us! You can do it! Stop Lord Darigan!" As the Buzz listened to the conversations of the villagers and understood what had transpired, he slowly lowered himself to the ground in shame. 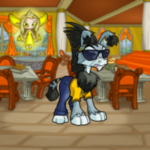 "My fellow Neopians, I'm afraid what you expect of me is just too great. I am merely a glowing Buzz. I offer you light, I can fly, but I am not a superhero. I cannot win a battle against the Darigan army by myself," he recited. "What about your powers?" asked a bright-eyed William. "What you have heard has simply been a myth," the Buzz replied. "I am sorry." Worried murmurs trembled throughout the group as hope was becoming lost. "I suppose we will have to leave," a disappointed Mr. H suggested. "Reedus, get your things now! We're getting out of here as soon as possible!" Penny commanded. With the fury within him ready to burst, Reedus loudly declared, "No! We can't let the Darigan Citadel do this. We're intelligent, hard working Neopians. This is the home we built. We can't let anyone scare us away." The villager's eyes lingered to the floor. "We're not strong enough," William said. "We don't have the battling skill to fight Darigan's guardsmen." "Maybe we don't have to fight. What if we came up with an idea outside the box? If we just think, we can pool our knowledge and resources together and help keep our village!" Reedus declared. Doubt prevailed amongst the village until Mr. H stepped up. "The boy is right," the Skeith declared. "This is our village. These fiends can't just break apart our village because it is more convenient for them." "You know, I've been reading up on architecture and construction," William revealed. "What if we built a wall around the village? I have several books about building techniques and castle making." "That's sounds like a plan. Our village is small enough that we should have enough materials to build a border. We can even fortify it further and add watch towers in case of an aerial attack," Mr. H added. "We don't have to enter a battlefield and fight, we just have to keep them out." The village was finally regaining faith, nodding in agreement. "Now, what about weapons or shields? Anything to help protect us," Mr. H requested. Reedus looked down at his little bag. He meekly rose his hoof and suggested, "We could use my motes. They aren't very strong, but they all do different things that could be useful in the right moment." He explained, "The bronze motes are good for shielding, and these water motes can give the wielder a boost. Then I have these rock and mud motes that can be used for attacks. They're not much, but..."
"--Reedus, hand out all the motes you can," Mr H. ordered. "Everyone, get to work immediately. We only have one week to prepare ourselves and secure our village." In the midst of all the excitement, the Buzz seemed to have slipped back into the sky without any notice. Instead, everyone else was focused on their goal to save their homeland. With the plans being put into motion, the villagers worked together to build a protective barrier. By the end of the week, their small village had become a makeshift castle. Reedus had crafted dozens more motes to hand out to his neighbors as they prepared their stations along the wall posts. Lord Darigan arrived the next day with a handful of his guards, seemingly expecting their job to be easy. However, when he realized the village had managed to construct their own fortress, he grew perplexed. The villagers stood tall atop of the village walls, determined not to budge. "What is going on here?" Lord Darigan questioned. Mr. H stepped up to the edge of the wall. "You have to find someplace else for your kingdom! We refuse to leave!" he shouted. Lord Darigan looked across at the passionate eyes of the villagers lined up along a minted protective wall. With a plain face he sighed, "Fine then." Mr. H managed to maintain a calm composure on his husky face, but his fists clenched with tension, not knowing what to expect next. Did he just concede? Was he about to attack? Then, all of a sudden the bright green light had faded out. In that moment, there was nothing but complete silence. The villagers were frozen in the dark, in fear of the unknown. Reedus could feel his heart racing. What could they do if they couldn't see? But then, a rumbling could be heard from above. Slowly, a silver lining of bright light began to appear from the south that grew closer and closer. Finally, sunlight had once again shined on the village and the Citadel floated away. Mr. H took a deep breath, relieved that it was finally over. The rest of the cheered loudly in celebration, their faces beaming with pride. Reedus walked through the streets of his now guarded community. Back onto Main Street, in the center of their newfound fortress, the glass statue of the Light remained, brightly glittering through the natural sunlight from the skies. "Great work," a voice expressed to him from behind. It was Mr. H. "This was all thanks to you. You inspired this village to stand our ground," the Skeith continued. Reedus gazed at the statue. "I never would have done it if he hadn't come." "How do you mean?" Mr. H asked. "I know he wasn't exactly what we thought he was. But still, just the idea of him inspired me--inspired all of us. He not only saved us from living in the dark, but he motivated us to work harder and be better." "That's a very wise observation, my friend," said Mr. H. "You know, maybe we should keep this statue here. Not just as a thank you for the Light in illuminating our village, but for all of us rising up to the occasion to rescue our home." With a proud smile on his face and an affirmative nod, Reedus stated, "I agree."